Hi Everyone, I have some amazing news today, Jean at Crafty Individuals has asked me to be on her design team. You can imagine how excited I was when I received the email and of course I said 'yes' straight away, what an honour and how fabulous to be working with such a brilliant, versatile and vintage range of stamps. I have collected a number of their stamps together and I hope to be using some new ones to the range soon as well. So this is my first piece to introduce myself to the team and the blog. 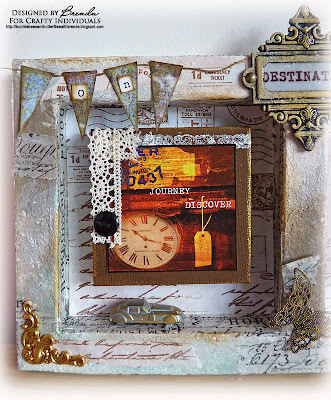 I chose to use some images from the ephemera sheets and make this textured, altered frame. I would love it if you popped over to the CI Blog to leave me a message there. I began by giving this paper substrate triple frame a coat of household undercoat paint and once dry I used a range of cream, beige and blue paints, applying them with different utensils and stippling with a brush to get a textured feel to it. Into the paint I added some torn tissue tape and torn pieces of paper - just cheap copy paper blended with some PanPastels then stamped with CI 161 text, CI 308 and CI 307 ticket stamps. This also was used for the frame backing papers. After that I mixed white acrylic and rock candy crackle paint and stippled over in various places to get more texture. The CI 'Life's Journey 1' images were adhered to brown painted mini canvases with some stamping, lace and buttons. The sides and insides of the frames were covered with tissue tape and the bookplate, banner and other embellishments finish it off. Thanks for looking today. I look forward to showing you more pieces using those fabulous Crafty Individuals stamps and products that can be found at the on-line store. Have yourself a creative day. Out of a Hat Creations - Favourite technique or product (This includes several favourite techniques and of course my most fave products at the moment are from Crafty Individuals) Good one girls. Oh Brenda...sending a huge congrats your way!!! This is fantastic news, and so well deserved. This frame looks amazing, love the colours! What sweet news this is, Brenda! Congratulations and so deserved! 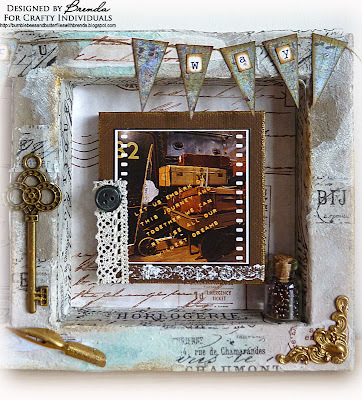 What a grand entrance you made with this gorgeous frame! Big Hugs! Congrats on your new DT position Brenda...they are so lucky to have you on their team! Your creation is stunning...your details are fab as always. I won't be able to visit you next week because tomorrow we will leave for New York!!! Congrats on the new DT, well deserved.Love the altered frame. Maybe we can catch up over coffee when the kids go back to school. Completely glorious project, and huge congratulations (as I said earlier!)... can't wait to see what's next!! Brilliant news Brenda. Congrats. Stunning project. Have a great weekend. Congratulations Brenda! Enjoy!! Beautiful frame you've made! Many, many congratulations on your wonderful news Brenda and your triple frame is a vintage stunner. Congratulations!! beautiful pieces you made! have a nice weekend! Wonderful project and great news about your new design team. They are so lucky to have you!! Many congratulations Brenda, good to know your talents have been recognised. Look forward to seeing more of your work on the CI blog. PS love this piece as well. 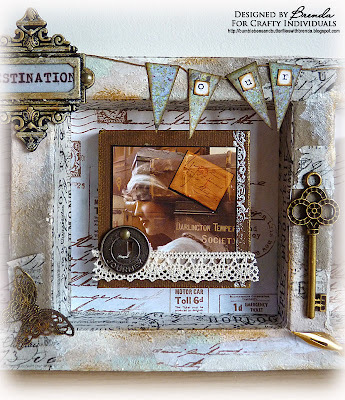 Congratulations Brenda this is the perfect design team/blog for you to be on, you are going to have some fun and inspiration from all those wonderful stamps, and if there is room for improvement in your work you will surely find it here, your altered frame is amazing, and you receive a wow from me. Many Congratulations Brenda, its fantastic news. Your project is stunning and as always has so many details and things to look at. Congratulations, Brenda! No surprise they asked you, hon, your work is fabulous! Today's unveiling is absolutely gorgeous. Each little panel is beautiful in its own right, and together you've assembled a total work of art. I love all the different textures you've included, the lace and metal, glass, buttons, etc. Totally fab!!! Great news! Congratulations. I will raise a glass of wine to you today! Loving your creation too! Breathtaking masterpiece!I'm excited about all details and embellis and and and.. such a awesome project. Congrats dear Brenda! No surprise, your art works are every time grandiose! Fabtastic news Brenda. You will be a fantastic addition to a very talented DT. I love crafty Individuals stamps, I sold them when I had my shop! congratulations Brenda. I look forward to seeing more of your beautiful creations on the CI blog in future. Congratulations to you, Brenda! And what a way to start things off, this frame is GORGEOUS!! Wonderful art piece, love the colors and all this little embelishments you added and like your blog name, great! ... eh, and thanks for telling me that I had this damned word verification on - I didn't know and turn it off now, cause it annoys me on other blogs too. So thanks a lot for that! Congratulations Brenda on your new DT role, this piece of work is just totally awesome, the images and design look stunning, I am in awe as I always am when I see your works of art. Congratulations Brenda...you will have a ball and I think you definitely deserve it. I really like Crafty Individuals stamps and possess quite a few. Congratulations Brenda on your new DT post I love CI things as well. Your altered frame is amazing! Congratulations Brenda, I am so happy for you and know you will thrive there. You have an awesome style that fits perfectly with CI stamps. This frame is gorgeous, so much detail. Thank you for all you have done in the past on The Stamp Man team, keep in touch! Finally got here and oh so not disappointed. This is a mega piece and done in your usual brilliant style Brenda. My english isn't perfect to say all that I think!! Hi Brenda - Nearly missed this one! Congrats on the new DT post, and if this opening piece is anything to go by - looking forward to the next creation. Thanks also for joining us at TioT for our travel challenge.